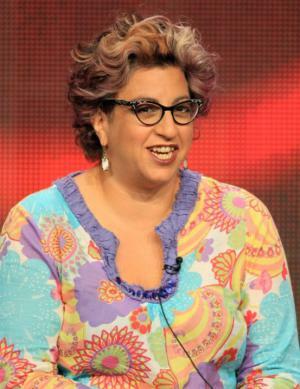 Jenji Leslie Kohan was born on 5 July 1969, in Los Angeles, California, USA,of Jewish descent. Jenji is a producer and writer, best known for creating the TV series’ “Weeds” and “Orange is the New Black”. Aside from that she’s been the writer for several other popular series and all her efforts have helped in putting her net worth to where it is now. How rich is Jenji Kohan? As of mid-2016, sources estimate a net worth that is at $15 million, mostly earned through her success in producing shows. Kohan has also been known to collaborate with other networks and companies. Additionally she owns the Hayworth Theatre in Los Angeles which she uses at times for productions. As her work continues, her wealth is expected to rise further. Jenji was born into a family who were very involved with show business; she is the daughter of producer, writer and composer Alan W. “Buz” Kohan and novelist Rhea Arnold Kohan. She also has two older brothers who are twins. Most of them have been known to win Emmy Awards. Jenji attended Brandeis University and later transferred to Columbia University where she completed a degree in English language and literature. One of Kohan’s first opportunities came as a writer for “Fresh Prince of Bel-Air”, and later she would get opportunities on shows including “Tracey Takes On…”, “Friends” and “Mad About You”. She also worked with her brother on the show “Will and Grace”, but later they went on their separate career paths due to differences in working style. She would then create the show “Weeds” of which she was the executive producer and head writer. The show which featured Mary-Louise Parker would go on and run for eight seasons, earning them multiple award nominations. After the success of “Weeds”, Jenji would go on and create “Orange is the New Black” for Netflix based on the memoir “Orange is the New Black: My Year in a Women’s Prison” by Piper Kerman. The popularity of “Orange is the New Black” earned it the title of the most watched original series on the internet television service. Netflix’s formula has proved successful because of how it makes full seasons available on release. It has also helped give a huge boost in Kohan’s net worth. Aside from television and film, Kohan often uses the second floor of the Hayworth theatre as a production office. She also has a deal with Lionsgate TV for productions and the like. Throughout her career, she’s received a total of nine Emmy Award nominations, including a win as producer of “Tracey Takes On…” She also has nominations for Writers Guild of America Awards and a Producers Guild of America Award. One of her most popular shows “Orange is the New Black” was nominated for 12 Emmy Awards. For her personal life, Jenji is known to have married Christopher Noxon, a freelance journalist, in 1997; they have two sons and a daughter, and are known to be active in Judaism, as Christopher converted before their marriage. 1 When I got out of college in 1991, I had four jobs in four different parts of L.A. There was I Love Juicy, a smoothie bar in Venice, and the Videotheque on Sunset Boulevard, across from the old Tower Records. I was also an intern at the 'Los Angeles Reader' in the Miracle Mile and at 'High Performance' magazine downtown. 2 We still have this prudish, puritanical culture, but we also have so little exposure to a diversity of bodies. Bodies are beautiful and great and compelling. 3 My ex-boyfriend said, 'You have a better chance of getting elected to Congress than getting on the staff of a television show.' Which was the perfect thing for him to say, because my entire career is, 'Well, screw you.' And we broke up. 4 I'm never going to look like a Nordic model, so I play with what I've got. Instead of going gray, I dye my hair bright colors; I have bad vision, so I wear sparkly glasses. I embrace that I look like a crazy lady. 5 My first job is to entertain, but if, while you're enjoying, you start to question something you never thought about before or empathize with, relate to, love someone you only thought of as 'other' once upon a time - how awesome is that. 6 Mainly, I'm doing my thing, and I hope people like it. I don't say, 'I'm going to write something radical and hope it reverberates throughout society.' The goal is to write a solid, entertaining, engaging show. 7 I'm from the creative side of Hollywood. I'm up for anyone that wants to support my work. If you have eyeballs and give me a budget and are nice to me, I'm in. 8 I was broke when I lived in New York City during college, so I'd spend weekends walking around town, grabbing something to eat, and interacting with strangers. That ritual has stuck with me. 9 I don't set out to write female lead shows, necessarily. I like deeply flawed characters. When they come to me, or when I'm introduced to them, I follow the stories and the people, rather than setting out to do a female lead thing. 10 I think great writers should write great shows, and I have trouble with, like, what you are in life shouldn't automatically make you what you do in your art. It doesn't necessarily translate. 11 I think shows that are completely dramatic are a lie. People use humor to cope. That is how we deal with things. In the darkest situations, there's humor. And if you don't show that, you're not being true to real life. 13 Personally, I like to yearn a little and long for the next episode. On the other hand, I'm also a glutton. My kids love to dive in and eat whole series at once. 14 It can go two ways with girls: They either bond or eat each other alive. 15 I love flawed characters, male or female, and I only want to talk about flawed characters, really, in what I do. 16 In my head I'm a rapper, but I'm not! 17 I'm a huge Ira Glass fan; I'm a huge fan of radio in general. 18 I'm not a public figure; I shouldn't have to be held to a certain standard of beauty. 19 'Be nice' is my family's basic rule but one that often goes unfollowed in Hollywood. There's always a moment when you can choose between being snarky and being kind. I opt for the latter - it's much less exhausting! 20 A TV touchstone for me is 'The Days and Nights of Molly Dodd.' That series was whimsical and smart and had the mix of comedy and drama that I now trade in - but with a dash of magical realism. I wanted to be Molly Dodd, but more than that, I wanted to be Jay Tarses, who created the show. 21 I can shoot off my big mouth and write my shows and run my shows, and I can recognize how lucky I am because my position is rare and my position is privileged. 22 What offends me more than something sexist is something poorly written or unfunny or cliched. 23 I believe in the power of media. I really do. It's my soapbox. And I do have an agenda, because I'm enraged by the limitations forced on people - by poverty, oppression, hatred, fear - and I'm saddened by the kind of loss we all experienced due to the contributions that people cannot make because of their circumstances. 24 For a lot of people, film is still the dream - the captive audience in the darkened theater - but I love TV. I think it's fantastic. 25 By nature, I sit alone in a room and type... My goal was never celebrity. 26 I am a huge, huge Regina Spektor fan. 27 Home is where your family is. Wherever you are, it's about the people you're surrounded by, not necessarily where you lay your head. 28 There's more to us than the moment we made a bad decision. 2 Daughter of Buz Kohan and Rhea Kohan, sister of David Kohan.